Semiconductor physics, quantum electronics and optoelectronics, 21 (4), P. 325-335 (2018). Semiconductor physics, quantum electronics and optoelectronics, 21 (4), P. 336-344 (2018). Semiconductor physics, quantum electronics and optoelectronics, 21 (4), P. 345-359 (2018). Semiconductor physics, quantum electronics and optoelectronics, 21 (4), P. 360-364 (2018). Semiconductor physics, quantum electronics and optoelectronics, 21 (4), P. 365-373 (2018). Semiconductor physics, quantum electronics and optoelectronics, 21 (4), P. 374-379 (2018). Semiconductor physics, quantum electronics and optoelectronics, 21 (4), P. 380-386 (2018). Semiconductor physics, quantum electronics and optoelectronics, 21 (4), P. 387-391 (2018). Semiconductor physics, quantum electronics and optoelectronics, 21 (4), P. 392-396 (2018). 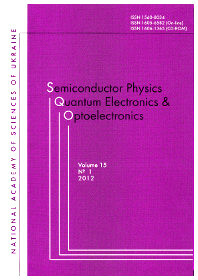 Semiconductor physics, quantum electronics and optoelectronics, 21 (4), P. 397-401 (2018). Semiconductor physics, quantum electronics and optoelectronics, 21 (4), P. 402-406 (2018). Semiconductor physics, quantum electronics and optoelectronics, 21 (4), P. 407-411 (2018). Semiconductor physics, quantum electronics and optoelectronics, 21 (4), P. 412-416 (2018). Semiconductor physics, quantum electronics and optoelectronics, 21 (4), P. 417-423 (2018). Semiconductor physics, quantum electronics and optoelectronics, 21 (4), P. 424-428 (2018). Reduction of speckle noise in laser energy distribution on the target by means of modified fourier hologram and incoherent averaging technique. Semiconductor physics, quantum electronics and optoelectronics, 21 (4), P. 429-433 (2018). Semiconductor physics, quantum electronics and optoelectronics, 21 (4), P. 434 (2018). Semiconductor physics, quantum electronics and optoelectronics, 21 (4), P. 435 (2018). Semiconductor physics, quantum electronics and optoelectronics, 21 (4), P. 436-437 (2018). Semiconductor physics, quantum electronics and optoelectronics, 21 (4), P. 438-442 (2018).